A popular trend since the late 1970s, the flower crown hairstyle has been revived time and again by many stylish chic girls. A little vintage, a little rustic, a little romantic, a little whimsical and oh so pretty – these floral crowns are every bohemian bride’s must have. How about having a little fun with this hair-do? We will show you how you can rock the pretty floral crown and the popular hair braid (which is oh so in-trend!) with a little Hawaiian twist. Leaving a few inches of stem, cut the flowers and roughly arrange them on a table to check how you want the crown to look. Once you are sure of the look, take them into small bunches and tape them separately. Measure the circumference of the crown according to the size of your head and start looping the garden wire together. Each loop should be a little more than the circumference of your head (probably 1 inch). Make about 6-7 loops and then cut the wire. Secure the ends with the floral tape making sure the ends of the wire don’t stick out (otherwise, it might end up hurting you). One the wire frame of the crown is made, take the small bunches of flowers which we had taped earlier and arrange them around the wire crown. Making sure there are no gaps in between, wire and tape them to secure the crown. There, your floral crown is done! Now to create the hairdo, first is the two side braids. 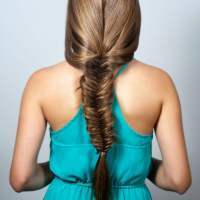 This hair-do is better suited for medium length to long hair. Those with short hair, you might want to opt for extensions. All you need to do is part your hair in the middle and then make two low side braids. Don’t make tight braids, just create very loose clumsy braids. After the braiding is done and secured with elastics, pull each braid sideways to make it even more messy. [P.S – Before making the braids, I usually prefer taking small sections from the front, loosely twisting them and securing with bobby pins behind the ears. This helps create an illusion of volume on your hair.] Finally add the floral crown for some romantic effect. Because of the drama of this floral hair-do, you might be thinking when and where to sport this look. Well, we do agree to an extent that this hair-do needs someone with a bold personality to rock them. But that’s not all; this look can make you look super cute and feminine when paired with subtle cute dresses. Perfect for the bohemian bride, you can also sport this hair-do during music festivals and some party-time fun at the beach.